Help! How can I deal with the anxiety in my life? Now, I hate to lose things and when I find out that something is lost, I have a tendency to “tear the house apart” looking for it. No stone should be left unturned – is my motto. And I look everywhere – even in the most unlikeliest of places. I even had my son shaking bags of garbage out on the porch – to see if they jingled. But everywhere we looked, no keys turned up. And I had a hard time getting them off my mind. My son was due to return to college in a few days and how was he going to get in his dorm? And on top of that, how were we going to foot the bill to have everything replaced? Again and again, I asked God to show us where the keys were. It was so simple to me: God shows us, the keys are found and we all learn a great lesson on answered prayer. I worried and fretted over those keys and you know what? My son figured out a way to get into his dorm, and we’ll pay for the replacement keys and ID eventually, so things worked out on his end. And as for me, well, God had to deal with me about my worrisome mentality. He showed me that he wasn’t happy with how I dealt with the situation. How I allowed it to eat me up with worry and anxiety and how I basically told the creator of the universe how he should work things out. Ouch. I did that – didn’t I? And so I had to repent and learn from the situation. Just a few days later, we came to a financial “crunch” in our weekly budget and we needed some fast cash to pay bills. I was expecting a few checks from my web design clients, so I left a message with one client and waited for the mailman to arrive. Surely, our answer to prayer would come in that day’s mail right? That was how God was going to help us, I figured. But then I caught myself. Maybe God was going to help us a different way. And when no checks showed in the mailbox and the client never returned my call, I made an important decision not to worry. God knew our need, and he would meet it his way. Interestingly enough, our Sunday School teacher brought up the subject of worry in church last week. And he brought in an article by Lynette Hagin from The Word of Faith magazine which says this, “In our world today, worry has become a way of life. Sometimes we don’t even understand what has us stressed out, but worry will still devour our energy, peace, joy, and happiness. It can even affect our health. Wow, faith in the negative. Now, who wants that? Not me. And I can honestly say that my energy, peace, joy and happiness were depleted those few days worrying about my son’s keys. During the sermon last Sunday, I discovered that my journal was missing. I needed that journal, not only did I have some important notes in it, I had slipped two CDs full of photographs for our church website in it. Ugh! Where was my journal? I’m sure the people around me knew something was up when I was frantically searching through all our things during worship. Worry and faith duked it out in me as I tried to concentrate on the sermon. And after church, when I could have gone on an all-out search, I decided instead to go and greet someone who hadn’t attended church in a while – leaving the journal to God. As I was visiting with the young mom, my husband snuck something in my hands – my journal! Someone had picked it up on mistake and returned it. Wow, think of all the time I could have wasted letting myself be overcome by worry. 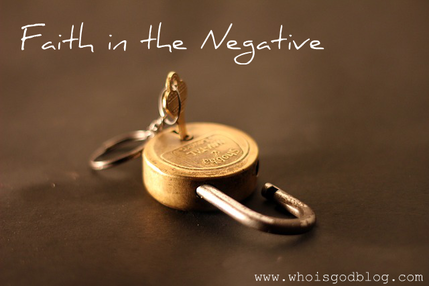 I’ll take faith -- it’s worry in the positive.